Like many girls who grew up in the ’90s, I first heard the word ‘milliner’ in Felicity’s Surprise, the third book associated with the colonial American Girl doll. Right around the time I was reading those books, my family took a spring break vacation to Colonial Williamsburg. Being, at 8, just as much of a nerd as I am now, I read everything I could get my hands on about colonial America. 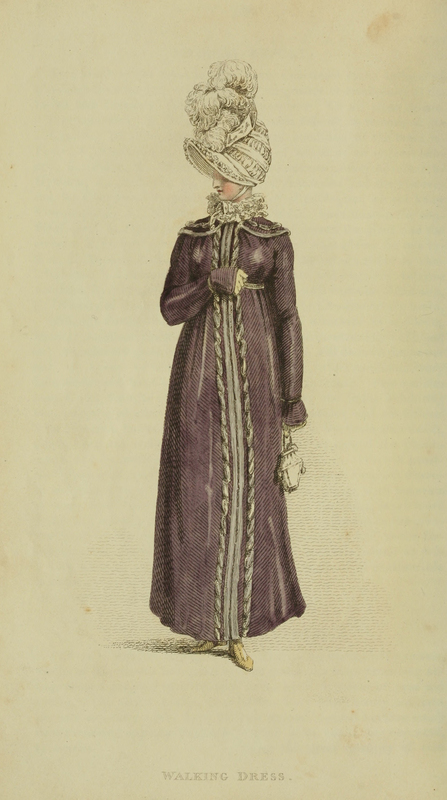 As if my encyclopaedic knowledge (as in, I’m sure I literally read any related encyclopaedia articles in my spare time), wasn’t enough, my mother also dressed my four-year-old sister and I in lovely handmade colonial dresses for the trip. I was in heaven. I couldn’t even wrap my brain around how amazing it was that there was a place in the world where everyone acted like it was 1775. We strolled the streets of Williamsburg, eating rock candy and dressing up my two-year-old brother in a tiny tricorn hat, until we reached THE MILLINER. 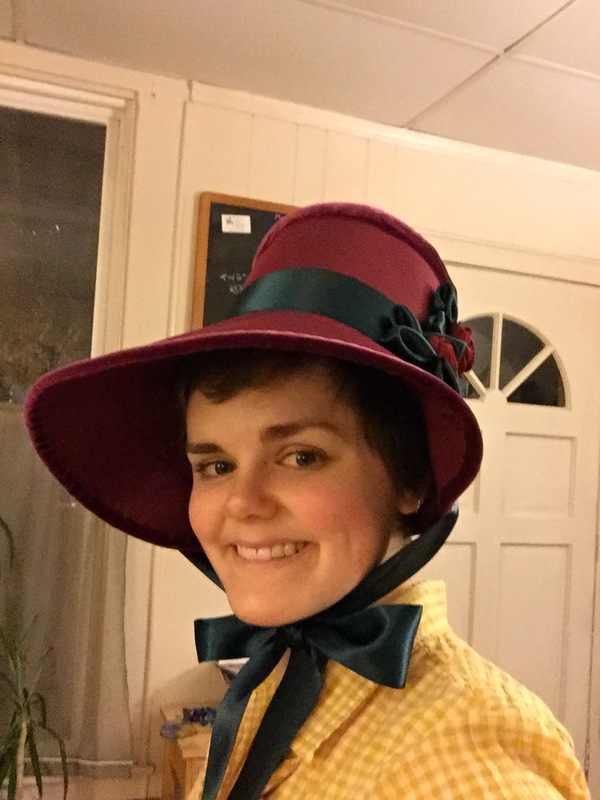 I knew all about milliners–I had read Felicity’s Surprise! I chatted away with the reenactors, thrilled beyond my wildest dreams. I would be totally embarrassed, except that as a reenactor myself today, I know how much fun it is to interact with people who are really excited about history, especially kids (if you’ve never taught four thrilled seven-year-olds an English Country Dance, you’re missing out). 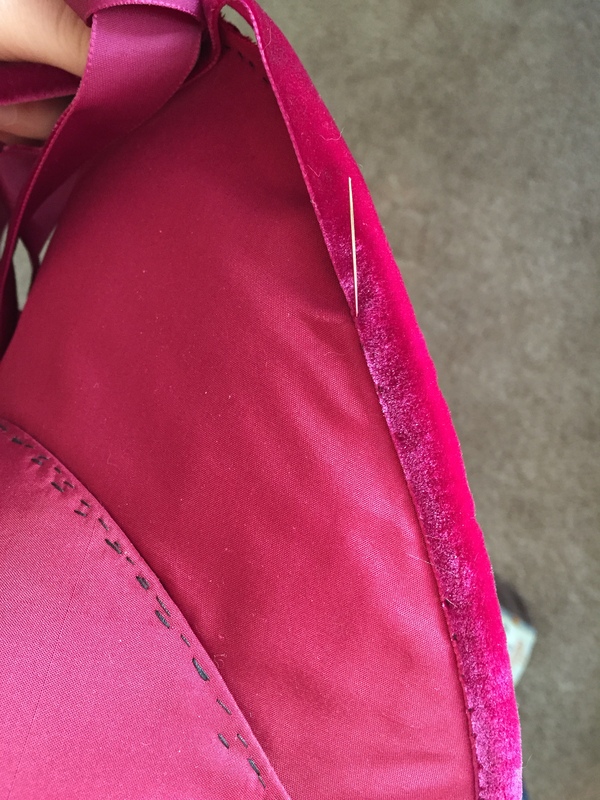 So, I talked all about sewing to the ladies there and they told me how maybe one day I could be an apprentice, and I wish I could find them and thank them, because they made one little girls year that day. In fact, I pretty much forgot that this wasn’t real, and when I realized I wasn’t actually going to move to Williamsburg and become a milliner’s apprentice, I was crushed. Like I said. Big nerd. BUT. Now I am a grown-up! It’s my turn to millin (I really wish that was a verb)! So after completing my spencer, it was time to create my very first bonnet (because who doesn’t like a matched set?). 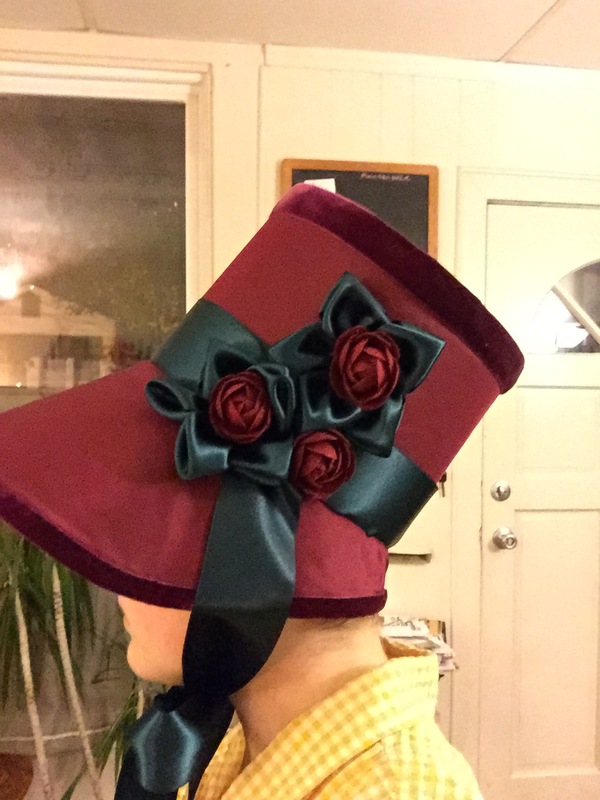 I used Lynn McMaster’s Regency Hard Crown Bonnet Pattern (view B). There are places where the instructions could be a bit more explicit, but I doubt this is an issue for anyone who’s made a buckram hat before. Even as a newcomer, it didn’t take too much head-scratching to figure it out. I’d definitely recommend it. The first step was to create a poster board mockup, which made me feel like I was back in kindergarten making paper bag hats. 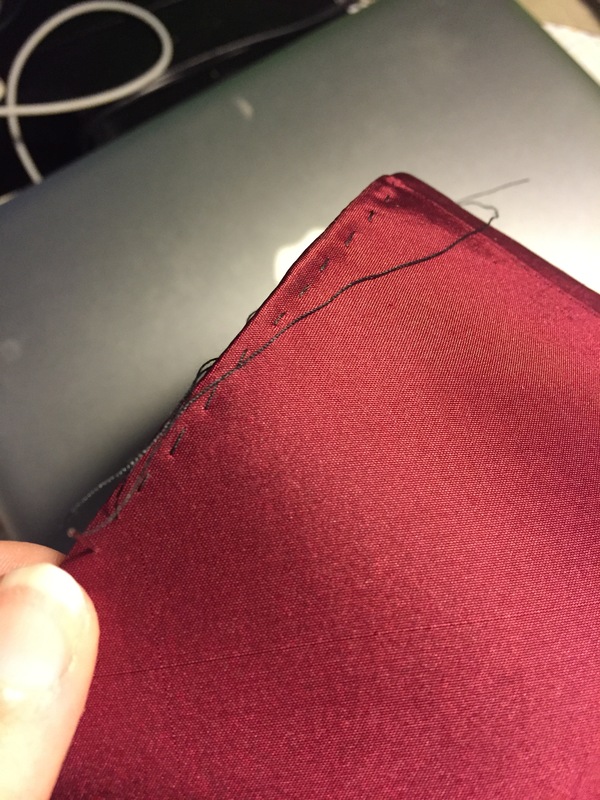 When I was sure that the mockup fit, it was time to cut into the buckram. 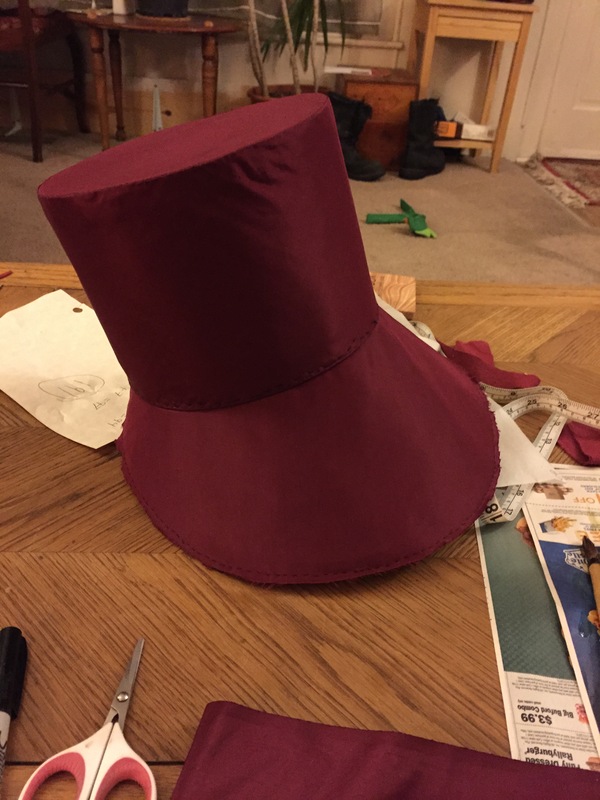 This made me pretty nervous, until I realized I had enough of the stuff to make a whole second bonnet if everything went really wahoonie-shaped (Terry Pratchett, anyone?). 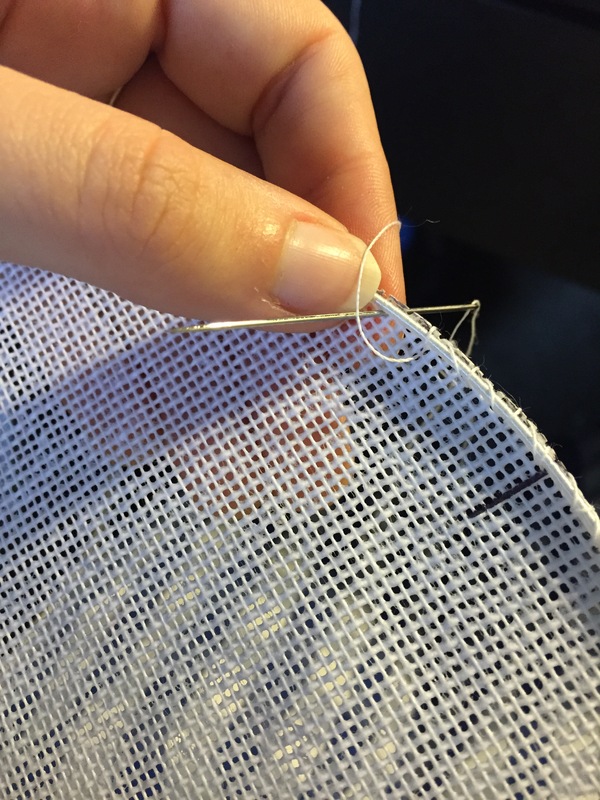 With buckram pieces in hand, I settled down to wire them. 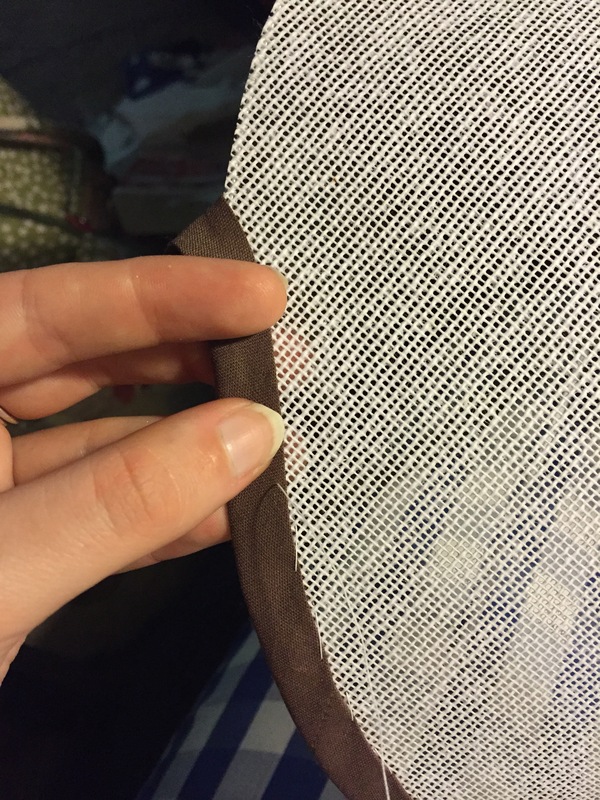 It’s oddly satisfying to stitch millinery wire around the edges of this heavily stiffened fabric. 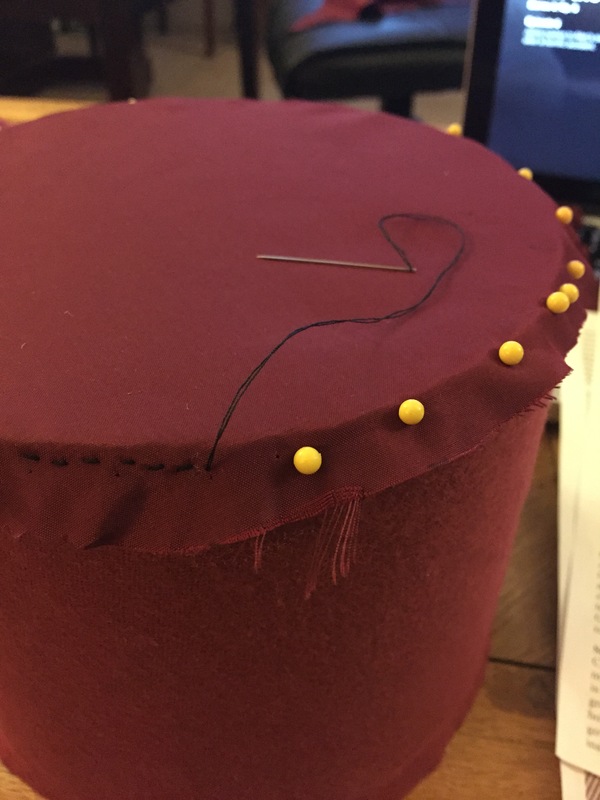 This step also included sewing the back seams of the brim and the crown side piece, and stitching the top of the crown to the sides. 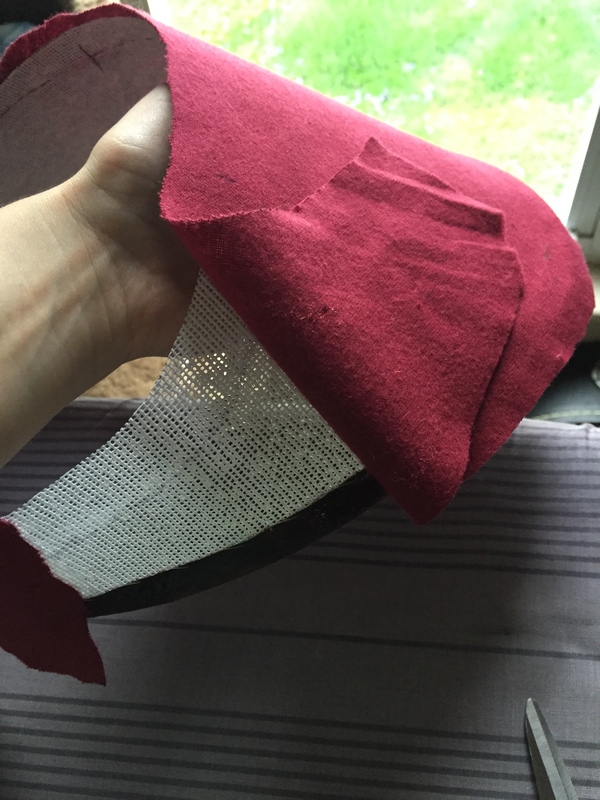 The buckram was a little unruly until I had it stitched about a quarter of the way around, and it’s tricky to find a good way to hold something so 3-dimensional while you’re sewing, but soon I had a funny-looking mesh fez. I definitely tried on pieces of the bonnet at every stage of the process. I’d lie and say it was to check the fit, but let’s be real. It’s because it looks hilarious. I realize now that this might have been the time for selfies…oh well. Guess I’ll have to make another bonnet. 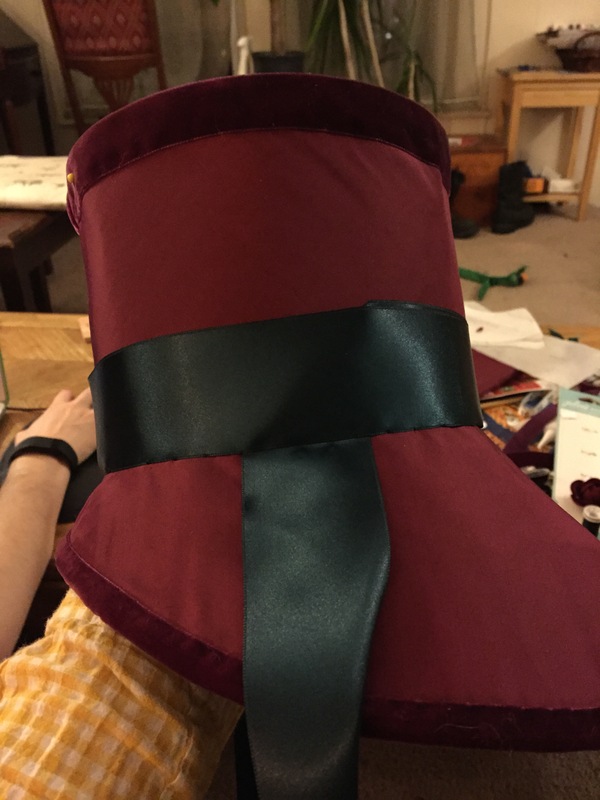 Once the form was wired, both both pieces got bias binding, and then covered with flannel, which smooths the silhouette of the bonnet and protects the outer fabric from the scratchy buckram and wires. 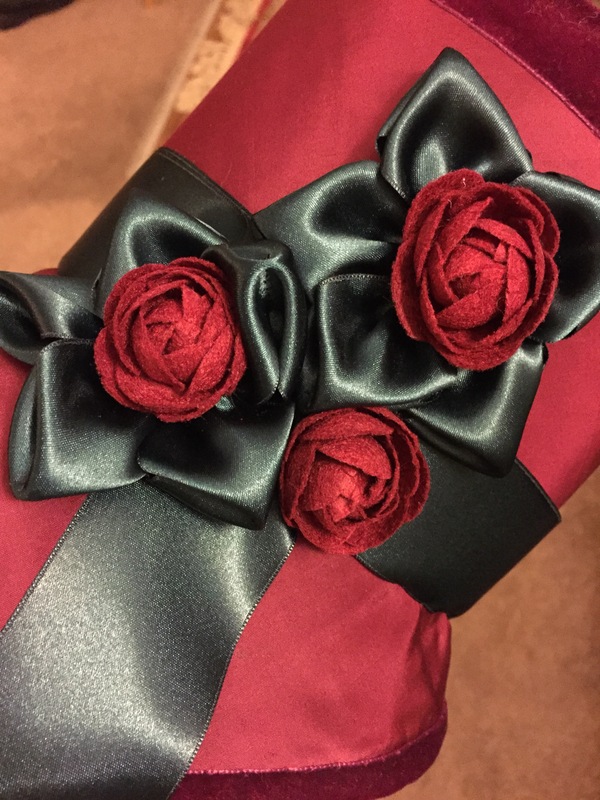 Somehow I missed taking pictures when I covered the brim, so I’ll skip straight to the fun part: decorating! Okay, so I lied a little. 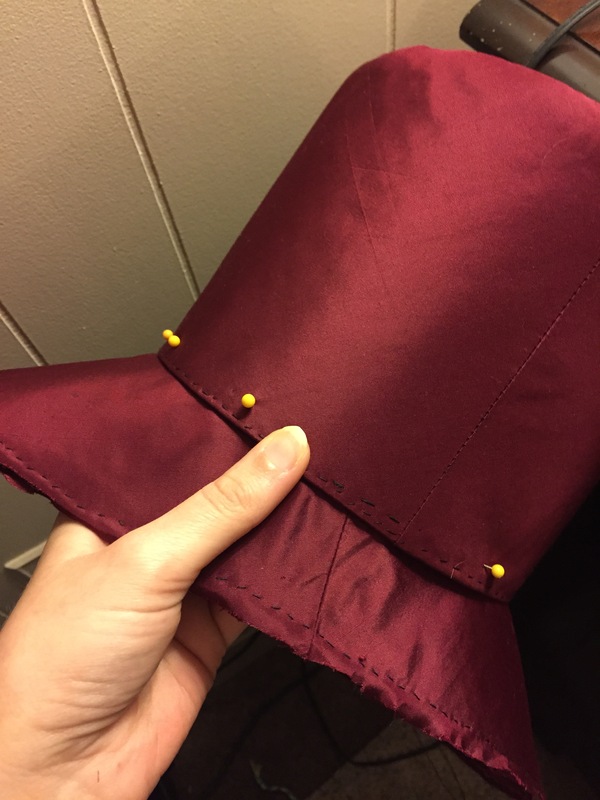 I did have to sew the brim to the crown before I could start decorating–but now it looks like a bonnet! 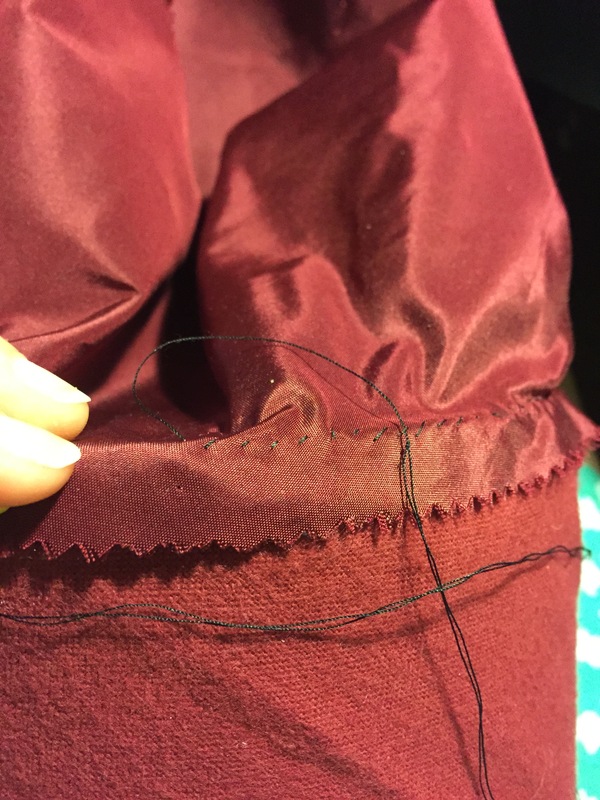 What a relief when the two pieces actually fit together without too much drama, beyond the inherent struggle of shoving a needle through all those layers. 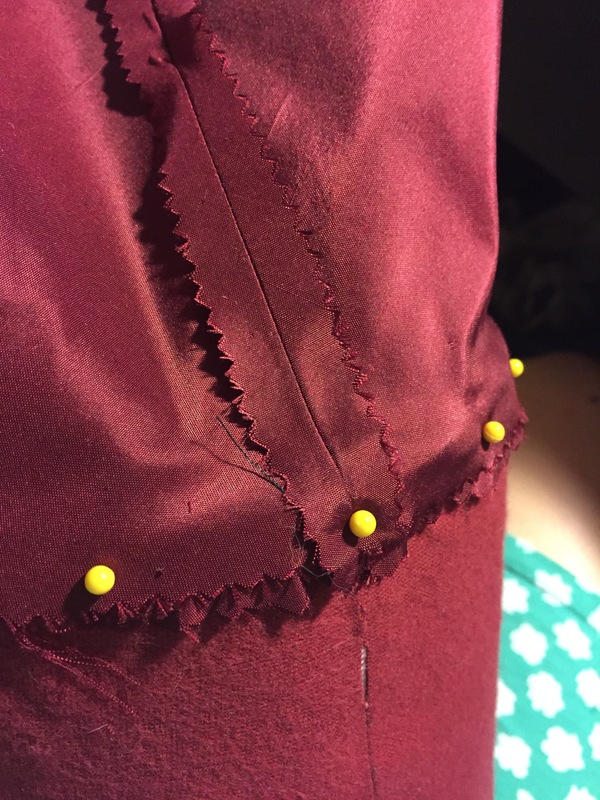 At this point I started straying from the pattern. 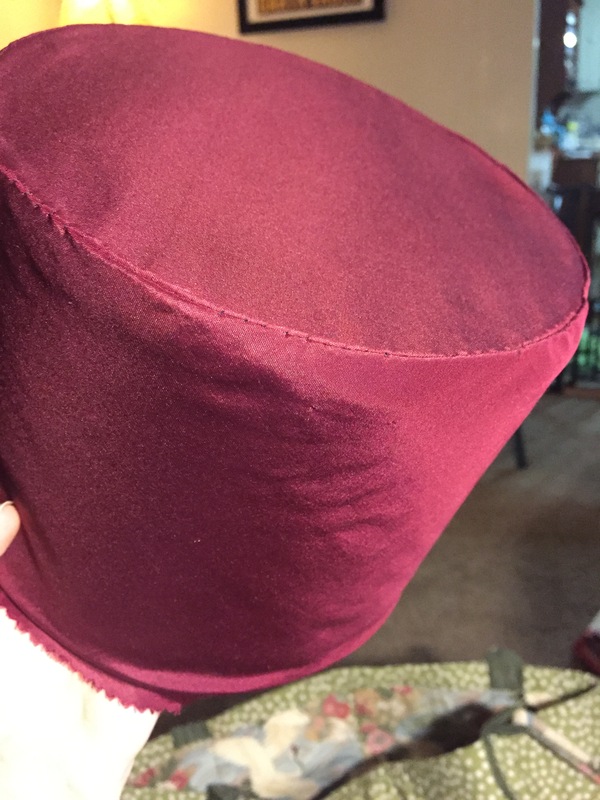 Instead of binding the raw brim edge with more of the taffeta, I edged it with that lovely velvet ribbon from Renaissance Fabrics (I bought the taffeta there too). Unfortunately, I took this picture late at night, and the flash made everything look magenta. 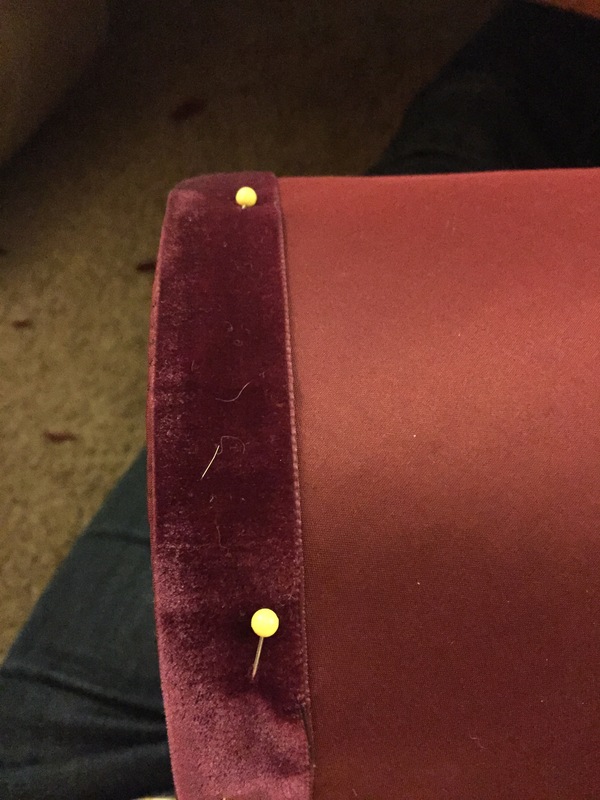 Just for good measure, I put a strip of velvet ribbon around the top of the crown as well. 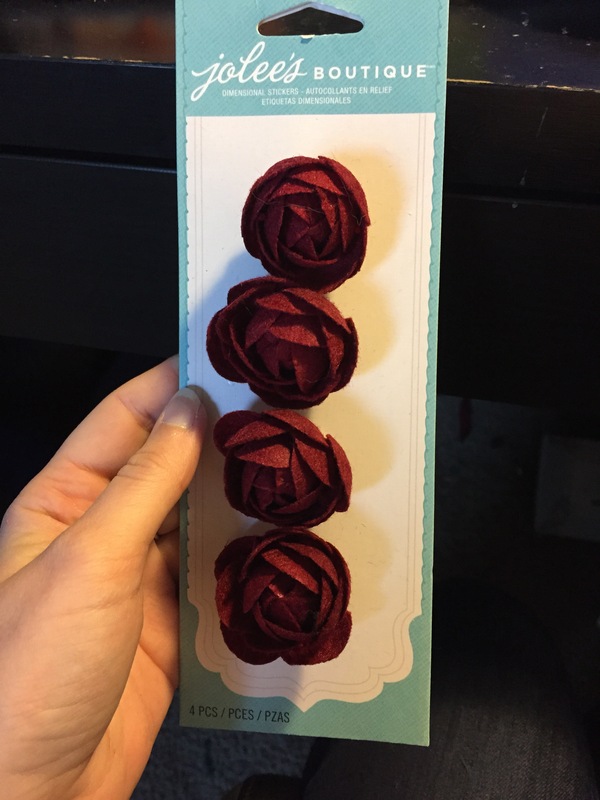 When I was at Joann picking up fabric glue and other sundries, fate led me to walk past these adorable little felt roses, in the perfect color to match the bonnet! 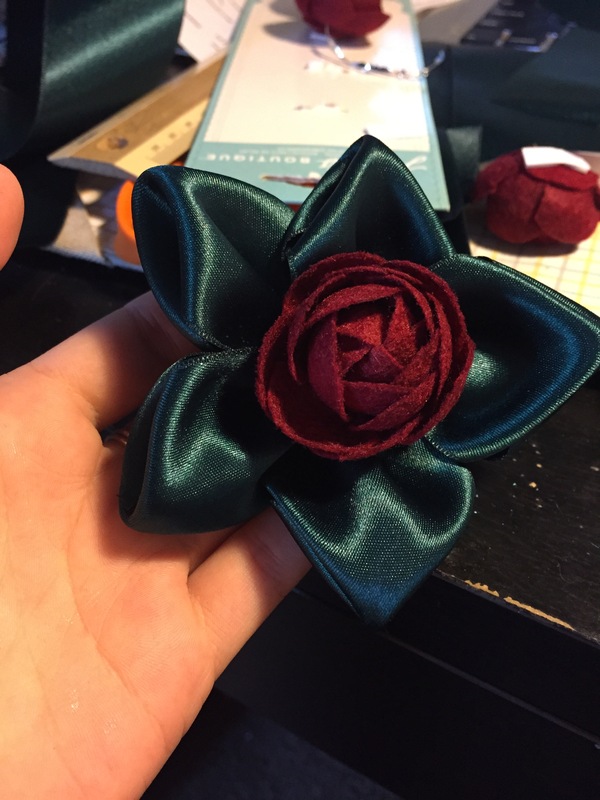 I made some of the green ribbon into flowers using this tutorial from What A Beautiful Mess, et voilà! The rest is history. The only thing left was to line the inside, which is a bit of a letdown from the fun of decorating. There’s definitely some ripples and bumps, but sometimes even a perfectionist likes me has to admit that this is just my first try, and I’m really pretty thrilled with the results. Can’t wait to show you pictures of the whole ensemble in action at Indiana Frontier Experience! I LOVE your Willamsburg story! Great hat but won’t the next one dwarf the pocket soprano?